Thanks for checking out my blog. 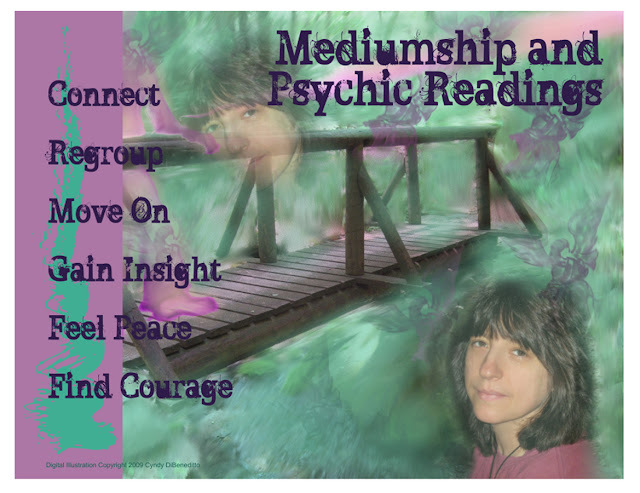 I will be posting tips on psychic development and spirit communication as well as my thoughts on the subject. And I am very excited to now be adding "Messages From Spirit" to my blog. These are messages that I receive from your loved ones who have crossed over. I will post them monthly so be sure to check back to see if one of them is for you! My Dogs Spirit Helped Me with my Job! So this is going to sound crazy but.... the spirit of my great dane helped me at my mediumship gallery last weekend! I know.. like talking to dead people for a living isn't strange enough, now I am telling you that my "dog" is helping me. But hear me out ok? We had to help our great dane cross over last Friday and it was so heartbreaking. We missed her terribly as we do all of our "furry" children when they move forward. I had a mediumship gallery booked for the following night and I wondered how I was going to do it, feeling the way that I did. But I decided that this is my lifes work and I really wanted to be there. So I was taking a shower before the gallery (great place for spirit communication!) and all of a sudden I "saw' my great dane looking at me with a white piece of cardboard in her mouth. And she was whining at me to get my attention. On the piece of paper it said "Auntie Annie". So I asked her what she mean't and she just kept whining. I got in my car and headed down to the gallery. On the way I saw her again with the same sign in her mouth with the same words "Auntie Annie" and the pronunciation was "Ant" like the insect. I get to the gallery and start reading and the first thing I ask is who is connected to Auntie Annie? It was the hosts psychic Aunt who had crossed over! How cool was that.. with the exact pronunciation. My sweet dog continued to help me through the reading. One image of her was so funny. She was on a skateboard and she flew past me several times. It was like watching scoobie doo! Anyway, the father of a woman there was into skateboarding and he taught her to do it also! So I learned alot that night.. not only do our pets live on, but they communicate with us and stay with us for as long as we need them to. How truly blessed I am. Thanks Deetkatoo! People always look at me like I came from Mars when I wear my "Expect a Miracle" button. Its almost as though they believe that miracles only happen in major ways and not that often. I believe miracles are happening all the time. I also believe that we must command miracles and then expect them to happen. We can do this by tapping into our creative powers and working with the universe to manifest our highest good in all situations. When we take a few moments each day to quiet our mind and connect with the creative centers in our brain and chakras, the dynamic power of the universe flows like a tidal wave to and through us bringing us the experiences that we asked for, to help us become more of who we are. We all have the potential to summon this power at any time. It doesn't matter what the situation is, we can change it by commanding a miracle, and expecting it to happen. The last part of this equation is the hardest.. we have to trust that the outcome is for our highest good no matter what it looks like! Whew! Inner Growth, Outer Growth, Undergrowth, Overgrowth... Getting the idea? Growth... We can't live without it. Our soul desires expansion. It is the reason that we when we get stuck, bored, unmotivated and tired that we just have to "change" something. We don't always know exactly what needs to change. Luckily we are spiritual beings with infinite knowledge and by having a conversation with our higher self we can get all the answers. Sounds simple right? Well, it isn't always so easy to get out of our own way and hear our inner voice of wisdom. One thing that can help us make the changes that we need to is to start noticing the ones that are already happening. What happened today that made you grow a little farther on your path to enlightenment? Was it an Inner Growth like a spiritual awakening, an Outer Growth like helping an older person cross the street? Or how about an Under Growth where you were able to take responsibility for actions you might not be too proud of, or an Over Growth like feeling an overall sense of well being for no apparent reason? Have fun growing! Who knows? You might even get a spiritual green thumb! I saw a beagle run the other day… it just took off at lightening speed! I was amazed and impressed. This little spirit so determined and in the moment that it passed people, other animals, cars and more, just so it could get the bird! It got me thinking… What if we could fly like a beagle? What if we could feel that sense of freedom and determination on our life path? Some might say that we could miss out on everything along the way. That’s one way of looking at it. I believe it could make us feel like our passions are so ignited that we move at lightening speed toward our goal. And what if our goal was to be loving, joyous, happy and free? The beagle never caught the bird, but for that moment it had a purpose so important that nothing would stop her. What makes you fly like a beagle? Some call it laziness.. I call it living life to the fullest! It seems that we have a hard time letting ourselves pause. Do we have to be busy 24/7 to feel good about ourselves? Do we always have to have a goal to achieve? I am on my way to the beach and I plan on being what some may call “lazy”. The only plan I have is to have no plan although sleeping on the beach sounds really awesome! Ten days of “nothingness”. I suppose it can look like I am not really accomplishing anything but the way I see it is … that in these times of “nothingness” I can hear my spirit loud and clear. For me, in this state of just “being” I can accomplish far more than I ever could “doing”. How about giving yourself a break today? Your spirit will sing with joy! To Mary: I am so grateful for you in my life. I love you dearly and I am so sorry that you had to see me leave the way that I did. I just couldn’t seem to find happiness again after carl died. You did everything that you could and please don’t blame your self. Remember the ring with the white gold and onyx. It is very important to me. From Jane. I want to talk to my sister. We had such a close relationship and I know how hard my passing is for you. I am here with mom and we are still baking all those great desserts… don’t worry about your sweet tooth… thanks for saving our recipes. It’s important that you move on… and be happy. From Joe: I am a catholic priest and would like to speak with my fellow brothers in the seminary. We were very close and I am still with you. Please remember to check the back door each night. I always seemed to forget to and it is important in the neighborhood you are in. To Alison: My greatest joy was knowing you. I wanted us to have a long time together but it wasn’t meant to be. Take care of the little one. You are a great mom and try not to worry about his illness. He will pull trough. I will be there with you. From Lorraine:I loved all the laughter I had with my brothers, all 6 of them. Please tell my daughter that I am just having a good time over here. I don’t feel eighty two anymore! No more aches and pains. Tell Ron it’s ok to start that new job… and give the grandkids a kiss for me. To Darlene: It is really awesome over here. I can’t tell you how much it meant to me when we were young and you used to hang out with me when no one else would. I left way too young but I am fine. Do you remember in math class when we would always get in trouble for writing to each other and not paying attention?. Oh well.. I still don’t like math.. Take care of your self and your time to shine is on the way. Many of my clients are suffering with their financial situation, whether it be a job loss, pay cut or extraordinary bills. They are wanting me to psychically connect with their higher self to help them see how and when they will attract more money into their life. Before I even do the reading, the one thing that I remind all of them is “What you focus on expands”… I understand how hard it is when you are in the middle of a financial crunch and not sure where your next paycheck is going to come from. It is when you feel this desperate that you must meditate and connect with your higher consciousness so that you find the faith to know that you are already being taken care of. If you keep going over in your mind the lack of funds you are experiencing you are shutting off the universal supply. The more you focus on something the larger it gets! So focus on the BIG picture… you being financially secure, happy and free… then let the universe do the rest.